Whitney Jennings surveys the court. Jennings had eight points and four rebounds in the win over Akron. Jimmy Lafakis/Collegian file photo. 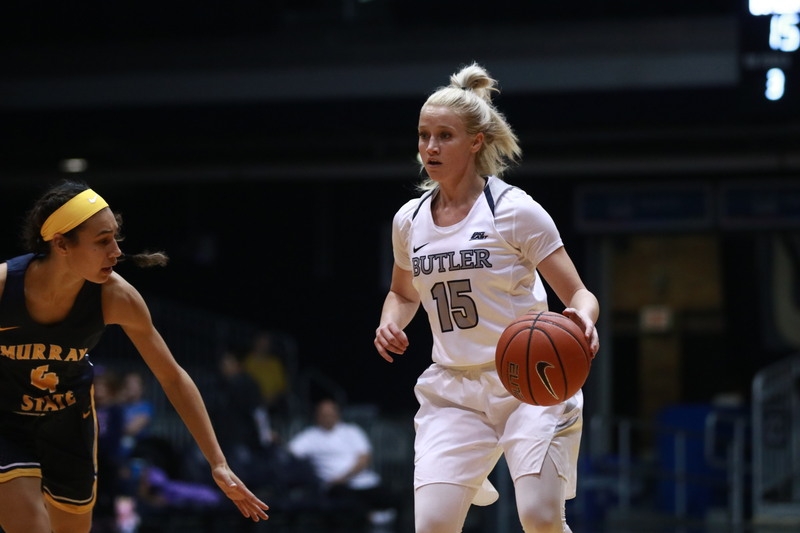 Led by strong first and third quarters, the Butler women’s basketball team beat Akron 63-47 to improve to 7-1. The Bulldogs won those two quarters by a combined 22 points. Kristen Spolyar scored 20 points on 7-of-13 shooting while Tori Schickel gathered her sixth double-double of the young season. A statistic to keep track of: Schickel is now ninth on Butler’s all-time scoring list with 1,345 points. She displayed her scoring acumen in the third quarter when she netted 11 straight points. The rest of the team struggled offensively, going a combined 13-for-37 from the field. Michelle Weaver had a nice game defensively with two steals. Spolyar added four steals of her own and the team recorded eight in total. The Bulldogs’ next game is on Monday, Dec. 17 against Indiana State at 7 p.m.